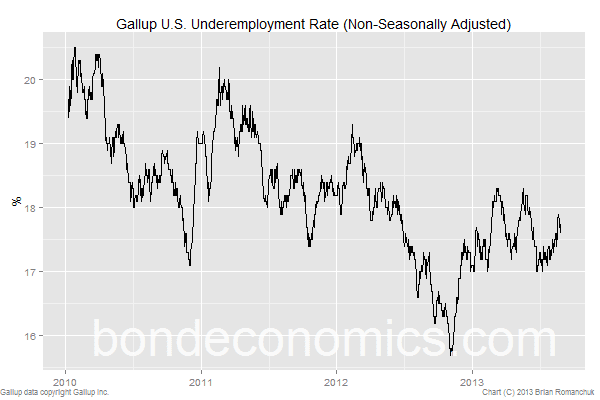 The spike in the Gallup U.S. Unemployment Rate poses some interesting questions heading into the August Employment Situation report (released September 6). (The unemployment data are available on the Gallup web site, and are copyright Gallup Inc.) Another muddle-through result seems the most likely outcome (which would imply that "tapering" by the Fed remains likely), but I feel that the risk of a surprise one way or another is a bit higher than usual. Given the laser-like focus of the FOMC on the labour market, the Employment Situation data will remain the main market-mover for bonds for some time to come. The Gallup series is a 30-day moving average of a daily polling result. The average peaked on August 20-21 at 8.9%, and is now 8.8%. A quick eyeballing of the data seems to indicate that part of the rapid rise in the unemployment rate was a short-lived spike; and so some retracement will occur as the result of base effects in the coming weeks. The other Gallup series on underemployment and the percentage of the population working are not as straightforwardly scary looking, but they also paint a fairly negative picture. 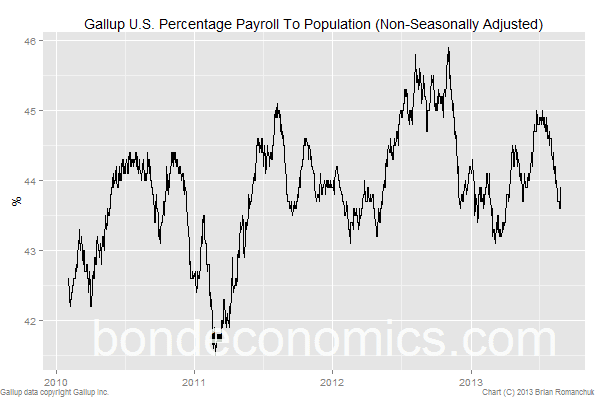 Importantly, the employment-to-population ratio is down year-on-year, and is roughly flat versus 2011. This is in-line with the official employment-to-population ratio (based on the Household Survey), which has roughly flatlined throughout the expansion. However, the weakness in the Gallup series has not been corroborated by other high-frequency data. The weekly jobless number (released today) show no particular problems. It must be recognised that the unemployment claims data has a much longer history of use, and so there should be considerable analytical weight placed on the official claims data. 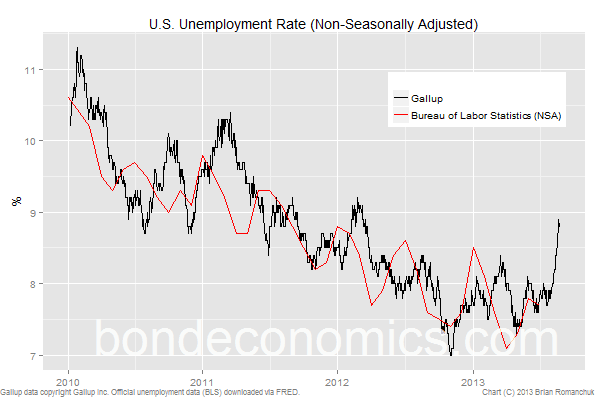 The Gallup data only goes back to 2010, which is too short a period to do a proper seasonal adjustment, or create a model linking it to the official (NSA) Unemployment Rate. Moreover, the U.S. labour market has faced some important structural changes over the period, as the private sector extricated itself from the 2008-2009 meltdown (and the public sector launched some random fiscal policy changes). A changing employment mix should disturb the seasonal patterns, making it even harder to launch a seasonal adjustment. As a final data note, the second estimate of 2013 second quarter GDP was released today. The real GDP number beat expectations, but I view the results are remaining mediocre. I prefer to follow nominal GDP growth, as the GDP deflator can be fairly loopy within a low growth environment on a quarter-on-quarter basis. Nominal GDP was only 3.2% (annualised), which is below the sub-par 4% which has been the "normal" growth rate since the end of the recession.